The 2012 BMW ActiveHybrid 5 is a full hybrid series 5 coupe, 0-60 in under 6 seconds, over 40 miles/gallon fuel efficiency, and availability starting in March 2012. BMW announced today details and pricing of their ActiveHybrid 5 full hybrid series 5 coupe. 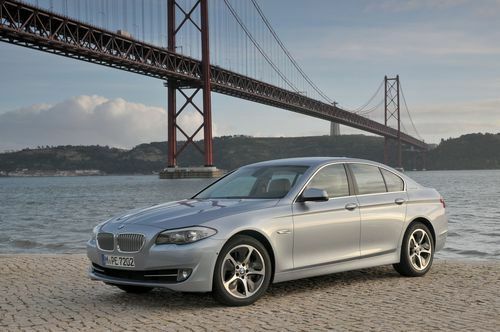 As announced last fall, the 2012 BMW ActiveHybrid 5 will arrive in US showrooms starting in March 2012. The car has an impressive array of technology under the hood, and a price placing it in the middle of high end luxury hybrid vehicles. The drive train is a 300 hp BMW TwinPower Turbo in-line 6-cylinder engine, coupled with a 55 hp electric motor, coupled with an 8-speed automatic transmission. The system provides a maximum output of 335 hp, giving drivers the thrill of 0 to 60 mph in 5.7 seconds. The ActiveHybrid 5 can be driven on electric power alone up to 37 mph for 2.5 miles. The ECO PRO mode is designed for optimum fuel efficiency, and for example the gasoline engine can be switched off and fully decoupled while coasting at speeds of up to 100 mph. An automatic start-stop feature shuts down the gasoline engine when it would otherwise be idling, such as while waiting at a stoplight. The electric motor is integrated into the transmission housing, and a clutch system is engaged when the electric motor is used to power the car. It can power the ActiveHybrid 5 by itself at speed up to 37 miles/hr, and can be used to provide electric boost during acceleration at other speeds. The 8-speed transmission combines a wide gear range with close ratio gear spacing allowing the gas engine to be kept at optimum RPM, for a fuel-efficient, low-rpm driving style. The control system is an intelligent energy management system controlling the engine and electric motor depending on driving conditions. It is also integrated with the navigation system to proactively adjust the engine and electric motor by looking forward along the selected route, based on the driving conditions further down the road. For example if there are hills on the selected route, the drive system can be adjusted to invest battery power in using the electric motor to provide boost for hill climbing. The 40-44 miles/gallon fuel efficiency is 10 miles/gallon better than the 535i. And with a base MSRP of $61,845 it's less than $10,000 pricier than the 535i. The chassis is a BMW 5 series with double-wishbone front and integral rear suspensions, Servotronic speed-sensitive power steering, and a high-performance brake system. The Dynamic Stability Control system integrates engine and braking while slowing down, and the car has Dynamic Traction Control, the Anti-lock Braking System, Cornering Brake Control, Dynamic Brake Control, Brake Assist, Brake Fade Compensation, Brake Drying and Start-Off Assistant. The safety features include high-strength structural components and large deformation zones, front and side airbags, side curtain head airbags for front and rear passengers, and seat belts everywhere. The BMW ConnectedDrive features available on the ActiveHybrid 5 include Park Distance Control, a rear-view camera, Surround View, High-Beam Assistant, Parking Assistant, Active Blind Spot Detection, Lane Departure Warning, BMW Night Vision with pedestrian recognition and Head-Up Display. It supports smart phone usage, and an iPhone app offers an unprecedented level of integration. In short what we have here is a BMW that is an efficient hybrid electric wonder. The 2012 BMW ActiveHybrid 5 is priced from $61845. I think this price is too high for the initial start. What do others think of the price: is it too high or just about right? ...I agree...it is a bit high..I will have a wait and see..and if it includes the driving experience of my M5...I may sell my M5....When can we test drive these puppy's ?